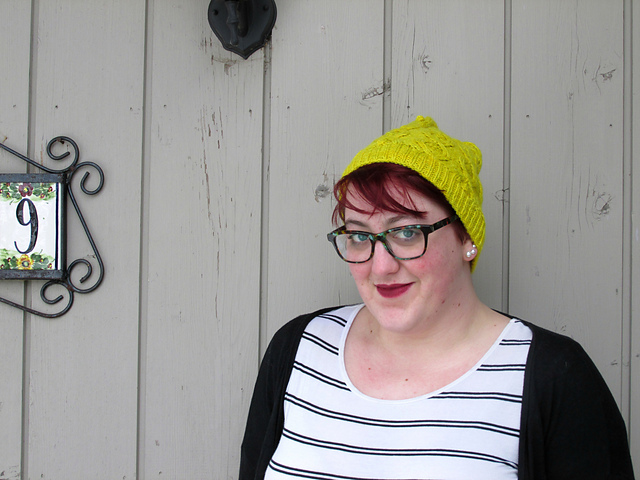 I got tagged in a blog hop by the amazingly talented Cory over at indie.knits. This actually gave me a lot to think about, and I feel like it's helpful to take stock of where I am in terms of my blog and my work. To pass it along, I'm tagging Tahnee over at Woollen Wilderness. A few different things right now. I just started my Xmas knitting (a little later than usual this year, but I've cut way back on project number and scope than in years past) for my mum and sister. I also have a pair of Rose's Wrist Warmers on the needles just for me, and another pair of mitts for a new design project. And a pi shawl I started on a whim. I'm also working on formatting and editing a couple of new patterns that will get released over the next few weeks. The word I find myself coming to most often in my knitting and design work is "charming." I want to be charmed by an object or charmed by the process of creating it. Textures, lace, and cables are all a ton of fun to work with, so I find myself trying to find new ways to make them work together. I've always felt like I must create things and put them out into the world. This is my way of interacting with the world, and the process of creation makes me really happy. I'm a self-taught knitter, and a lot of how I do things was just made up along the way. As a result, my design philosophy is "Why the Hell Not," so there's a lot of trial and error. Very rarely does any idea stay the same from conception to actualization. 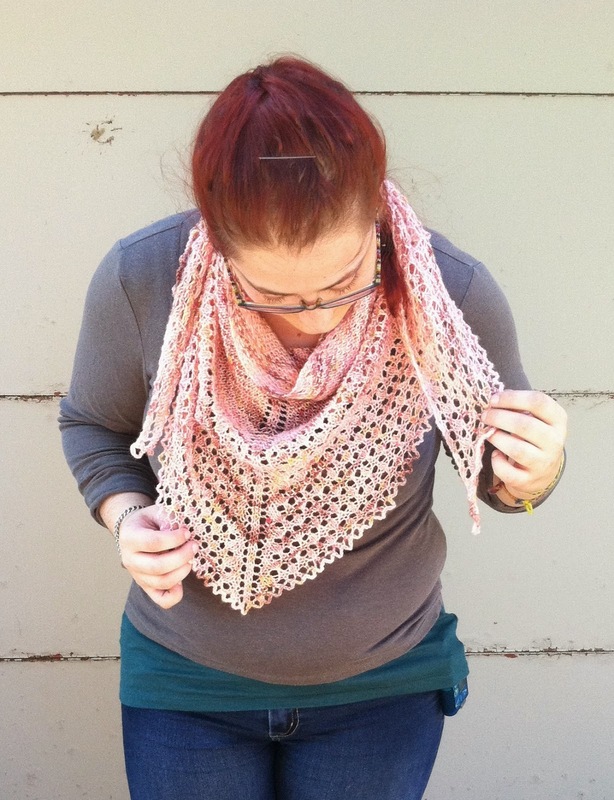 As an example, Peony started out as an allover cable shawl with a wide center panel instead of a spine. That idea hasn't totally died, but the end result is very different, while still keeping the essence of what I wanted. It's hard to describe, but it looks like what it felt like as an idea, even if it's totally different. On the other end of the spectrum, Transitions Sleeves turned out exactly how I intended. 1. FINALLY started Xmas knitting (well, one of them-the second one I'm having second thoughts on, but I think I'm still going to go for it). It's later than I usually start, because for some reason I can't get in the right mood for it this year. But like I said, I started Top Sekrit Xmas Project #1 and so far it's going really well. Except I'm already nervous about running out of yarn. So I really need to get this one done soon in case I need to order more. 2. In case you've dropped the holiday knitting ball too, I have a quick accessory pattern coming out this week. I love it, I think it's super cute, and it knits up in a couple hours. Boom. So keep an eye out for that. 3. It's finally starting to get cold here, which means I've been fighting with my office HVAC system again. My office won't get above 60 degrees Fahrenheit, which isn't super terrible, but it does get a little chilly. To cope, I have two pairs of fingerless gloves in progress right now (actually just finished the first glove of one pair last night but haven't taken any pictures yet). 4. Friday I'm taking the day off work to go see Anemone for Halloween and I realized that I have two different reward punch cards for the yarn store there that each have only $60 left before I get free yarn, so we'll see how that develops. 5. Related to Xmas knitting: intarsia is weird and I'm definitely doing it wrong but I am a wayward knitter and rules are dumb. At least it looks cool so far. 6. I maybe accidentally cast on for a pi shawl this week even though I have Xmas knitting to do and a buttload of design projects to start finish. 7. I'm really sorry there's no pictures today but I promise there will be tons of pics next time. I was worried about this shawl for a while-it seemed like it was going so well after I had to start it over, but then it started feeling like it was never going to end. Once I finally got to the border it started flying along again, but there definitely was a rough patch in the middle there. Now that it's all done, it's so worth it. Blocking it was an adventure, as I told you all. It took longer to dry than most shawls, so I had to carry the dogs around the mess of pins in the floor for a couple of days. I've worn it several times since it finished blocking, and I really like the size of it. The yarn is absolutely perfect, and a perfect match to this pattern. I'm really very pleased with it and so far I love having it in my shawl rotation. Yarn: Malabrigo Sock, #63 "Natural"
Yesterday the postman brought me the best kind of mail. Holiday edition of Knit Simple, plus some books from KnitPicks 40% off sale, buttons for my Gothic Lace cowl, and a nice big bottle of Kookaburra wool wash. Yum. I've already flipped through both stitch dictionaries, and they're definitely worth the investment, and I'll hopefully be spending a lot of time looking through Knit to Flatter. From a quick first glance, it looks like there's a lot of good information in there to chew over. Yesterday I also finally sat down and organized my circular needles. They used to just be thrown all in these two boxes, all tangled up, and it took a while to find what I was looking for. I've seen other people use this solution, so when my brother decided he didn't want this one anymore I grabbed it. It's a low-risk solution, and so far I love it. Eventually I'd like to invest in a good vinyl one, but for now I like this a lot. I cast on an impulse project last night and got the right needle in 5 seconds. Seriously. I even labeled the tabs! So yay. Personal growth. This has also motivated me to finally get or make some needle rolls for the double points. Because as cute as the vintage teapot is, it's ridiculously difficult to find a complete set without dumping everything out. The teapot is still super cute though, so I'll still definitely keep some sets in there, but there will definitely have to be more discretion about what goes in it. I let these go too long and started resenting them pretty hard for not being done (I know, if I would just actually knit the socks they would be done, and I wouldn't resent them). Now that they're done I absolutely adore them. Those colors. Those floats. Sheer perfection. They were a joy to knit, and I got pretty much the whole second foot done in one day once I picked them up again. I wore them one day on my vacation with my Birkenstocks (bad heel blisters=no real shoes) and the sole of the first one has already almost worn through, so I'm super pissed about that. I don't know if it was the Birkenstocks, or the yarn, or what, but I haven't had this problem before. Thankfully, it doesn't look like it actually tore through anywhere, so once I get them cleaned I'll see about reinforcing the soles. Anyway, they were lovely once they were finished, and hopefully I'll be able to salvage them so I get lots more wear out of them. Will keep you posted! Yarn: Red Heart Heart & Sole, "Watercolor Stripe"
Done! I finished with about 10 days left in the KAL, but it took about four days for my sweater to dry after blocking. Last Friday was finally supposed to be pretty chilly, so I sewed my buttons on first thing in the morning and wore it all day. Then again all day Saturday (Sunday it warmed up again, but otherwise I would have worn it again-I get a little obsessive over new FOs). Mods! Because there are always mods: I never keep track of how many stitches I pick up for the neckband, so that certainly isn't worked how it's written. Other than that, I shortened the sleeves by about 20 rounds because I thought they might get too long. It worked out perfectly, and they ended up just the right length. I am officially on vacation right now. For the next week, I don't have to even think about my day job. This is my first proper week off since college, probably, and I intend to enjoy every minute of it. My Havina shawl, and it is gorgeous. I took pictures to see just how big this blocked out to, and it grew a lot, considering it's mostly stockinette. Can't wait to get FO pics of this one. On a different note entirely, it turns out that while I have no problem writing a cable chart, I am apparently incapable of reading a cable chart. I was hoping just to tear back the center 15 stitches, but I ended up tearing out all the cables. Knitting surgery is going well so far, and I should have an up-to-date progress photo on this bad boy soon. My current pair of socks has been kicking around in my purse since the end of August. I love this pattern, and I love the colors in the yarn. The first sock was done in three days, but since then I've only managed to work a couple of rounds at a time on the second one. Once these are done, I think they'll be a favorite pair. I don't know if I've ever matched a pattern to a yarn so well-I love how the horizontal lines work with the stripes. I'm a bit worried about how these will hold up-I worry about the durability of the long floats, but these are certainly going to be very pretty, and I'm having a lot of fun knitting them.